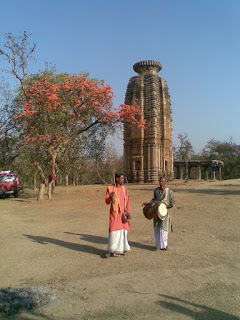 On 26/02 night we(Isabella,Vidyut and me) left for Adra,Purulia to spend our holi/Dol at Purulia (Chelyama,Bandhar Deul). Vidyut joined us at Howrah station. It is an overnight journey. Train to Adra — Adra Chakradharpur or Rupasi Bangla or Purulia Express — from Howrah. We went by Adra Chakradharpur express to reach Adra station, early in the morning on 27.02.2010. The journey takes around 5-and-a-half hours. Dol or Holi is celebrated in a unique way in some parts of Purulia, at Chelyama in Raghunathpur-II . Our stay was arranged by a local organisation, Manbhum Sanskriti Kendra in colloboration with Banglanatak.com. During Holi/Dol, they organise car pick-ups from the station. A 45 minutes drive later, we arrived at our destination, Chelyama. We were thrilled that we would be staying in tents pitched amid tall Palash trees. The tents turned out to be bit too hot, complete with mattresses, blankets and pillows. The beauty of the place lies in the fact, that there is forest all around that place. Isabella was scared of Vidyut's snoring, so we managed to get her a separate tent. 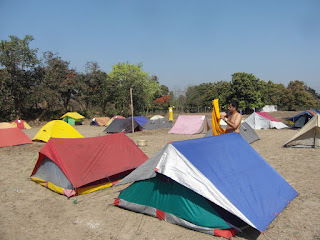 Vidyut and I shared a tent with an employee of Banglnatak.com - Bikashda. In the morning we wandered around the place through the forest and went to the villages. After having our lunch we went for sightseeing @ Rs 150/- per head. We went to see some dilapidated temples and the river Damodar.We were told that number of Rekh Deuls (Orissa school of temple architecture) were submerged under water after the Dam was erected by DVC. Even today some of the Rekh Deuls are under water. For the first time I saw/understood the problem caused by those dams. We saw the villagers ferrying illegal coal from mines, nearby. 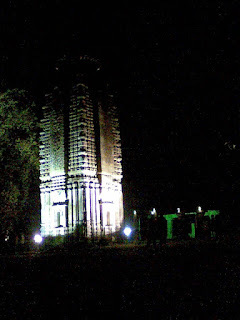 In the evening the whole area was lighted by halogen lamps wonderfully. We saw some cultural programmes. I was particularly impressed by Natua dance. We saw tribal bonfire too! The night is quite cold there. The next morning, waking up to the sound of birds and the rustle of leaves, I stepped out of our tent to be greeted by a crisp sun and baul singer Sasthi Baul strumming his ektara and singing: “Bhenge mor ghorer chabi, niye jabi ke amare!” It was a moment to cherish. 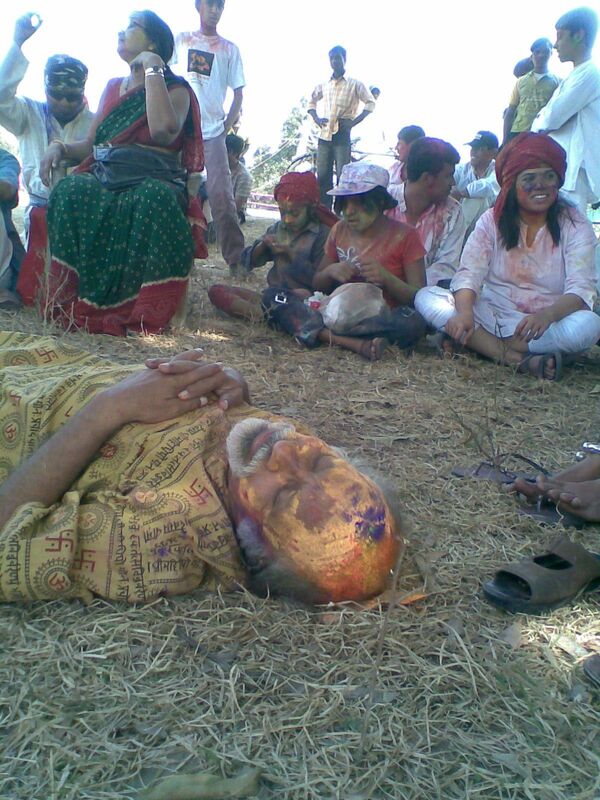 The Holi/Dol festival is organised around a magnificent temple dating back to the 8th century — Bandhar Deul. Villagers say the deity was stolen many years back and no one now knows which God the temple was dedicated to. In the morning we started playing with abir to the tune of baul songs and drumbeats. Sasthi das Baul wasted no time in flirting with Isabella - whom Isa referred to her boyfriend! Subhas Roy at the background. There were around 250 visitors from Calcutta and beyond, and we all enjoyed the festival together. Famous singer Anasuya came to see the festival. Smeared in colours of every hue, we sang and danced throughout the morning. 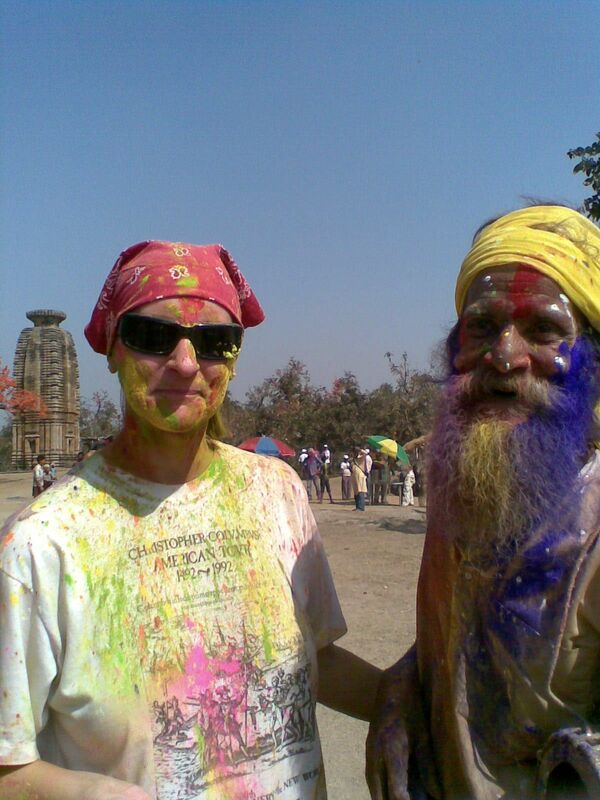 A group from "Sappho for Equality" also came to enjoy Holi. We sat beneath a tree to listen some Baul song. I also took 2 glasses of "Mohua" - famous local brew ! Fiery red Palash trees added to the festive feel. The organisers had thankfully set up a dozen temporary bathrooms and in the afternoon we put them to good use, scrubbing away the day’s work! After lunch we brought our bed sheet and settled beneath a tree,beside a pond (since the tent was very hot) and Isa,Vid and I chatted till it became dark. It was really enjoyable and refreshingly cool. In the evenings, we enjoyed chhau, jhumur and various other folk dances and baul fakiri songs. The bauls had come all the way from Asan-nagar in Nadia district. About 10,000 people from nearby villages came to watch the evening performances, giving the place the feel of a huge mela. A Calcutta-based organisation, banglanatak dot com, founded by Amitava Bhattacharya, has helped the local people develop a community-led heritage folk tourism during Holi. Set amid beautiful landscape, Chelyama also has terracotta and Jain temples dating back to 6th-8th century. In the morning we heard some Bauls song around the Rekh Deul. In the morning we wandered around the place through the forest and went to the villages. Many people left for Calcutta. In the morning there was Kabi sammelan - "poetry get-together" - local people reading out their self composed poetry. In the evening we saw some programme and left for Adra station around 9 p.m. The tents were organised by Manbhum Sanskriti Kendra, Subhas Roy (9932780094).He is an authority of this region and doing his Phd based on local theme. One can also contact Siddhanjan (9831 38 26 72) of Banglanatak.com. The organisers provide very good food (veg/non-veg) and mineral water. The food is not at all oily and it is obvious special care is taken about it. Every year this Basanta Utsav is being organized . 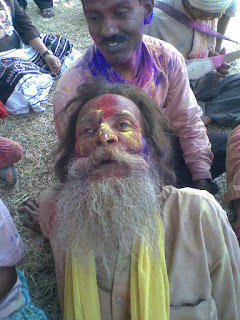 I strongly recommend it, instead of Holi at Santiniketan. They charge only Rs 1000/- per person. For pick up and drop service from the station they charge only Rs 300 - which is reasonable considering the distance. We reached Calcutta on 02/03/2010 early in the morning. It was an amazing experience.